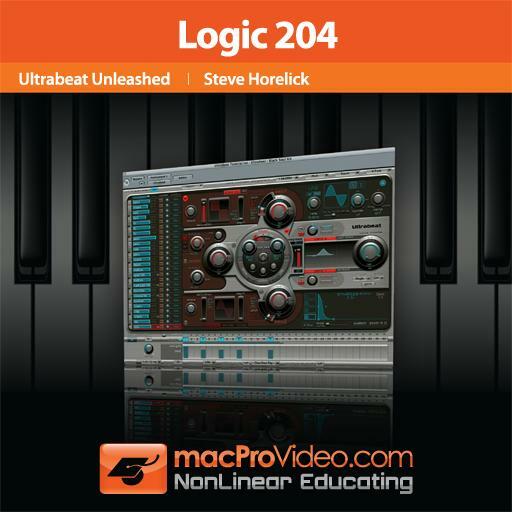 Logic 204 - Ultrabeat Unleashed. What is the main function of the mute button in the parameter offset area? How do you bring patterns out of Ultrabeat, into your session? How do you initiate parameter offset sequencing? Toggle the edit switch on the left side of the step sequencer from "voice" to "step"
What direction does the audio signal path flow in Ultrabeat? Which pattern modes in Ultrabeat are synchronized with Logic's session click? How do you enable a MIDI controller to mute/unmute individual voices. What is the purpose of the voice mute mode? Once you’ve turned on Ultrabeat’s step automation feature, how do you write automation? How do you activate Ultrabeat to be multi-output? If you are sequencing a beat and want to "humanize" a hi-hat or shaker pattern, what method does Steve H give you to accomplish this in this tutorial? What kind of trigger groups helps create a convincing open/close hi-hat sound? How many different offest parameters can you sequence on an individual voice? Can you adjust swing to be on some voices, but not others? Sometimes, depending how Ultrabeat feels. Yes, by using the swing on/off switch on individual voices. No, it is a global command. Which notes does the swing knob effect? You have answered 0 out of 16 questions.